ACGIL Softwares - ERP, HMIS, CRM Software Solutions in India: Why Web Based ERP is more ideal than Server Based Solution? Why Web Based ERP is more ideal than Server Based Solution? 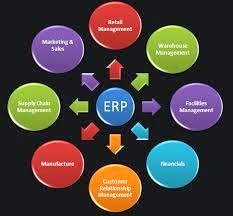 ERP software solution is helpful streamline the functionality and technicality of an organization. A web based ERP software simplifies the automation of back office process for mid sized business organizations. This solution provides real time information about finance, inventory, order management, purchase and much more. With web based ERP, one can speeds up business, improves reliability and productivity of an organization and provides higher degree of support to clients and suppliers. Being browser based, this ERP software significantly reduces your overhead expenses and ensures that it is fully secured for data and reports. There is no need to install any software for it, no hardware to purchase and maintain, and no up gradation requiring complex re-implementation over time. A web based ERP system improves business among customers, partners through self-service portals, providing for lead management, bill payment, shipment tracking and many more.